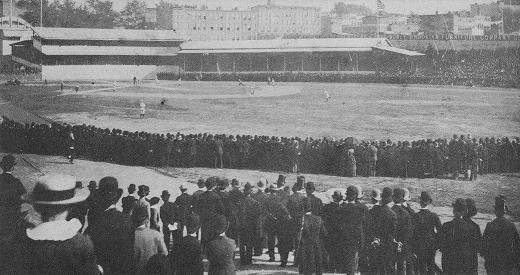 The Brooklyn Bridegrooms (Dodgers) and the Pittsburgh Alleghenys (Pirates) faced off on September 1, 1890 for the first-ever triple header in major league baseball. Playing at home at Washington Park, Brooklyn swept Pittsburgh: 10-9, 3-2, and 8-4. And those fans were standing up? And in such heavy clothes! It was probably hot, being still only September. The way people dressed for the old time baseball games never ceases to amaze me. Each of the last two years, the Royals have had a “Dress to the Nines” day at Kauffman Stadium, and while I like the idea of dressing up for a ballgame, I’m considerably more comfortable just going in a tank top and shorts.